Our new website is redesigned to provide greater informative and educational content. I am especially happy with our new photo gallery with which I am extremely pleased to announce the launch of our completely redesigned website. After working very closely with a wonderful web design and SEO company, Find Local Company, we have revamped our website which allows greater ease of search and wonderful high quality images. 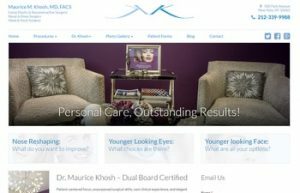 My deep gratitude to my patients for allowing me to use their photographs on this site. I invite you to page through our new website. I welcome your comments or recommedations regarding further improvements to our site.